Dr. Steven Pritzker is a teacher, researcher, writer, speaker and creativity coach. He conceived and is Co-Editor-in-Chief of The Encyclopedia of Creativity, a groundbreaking two volume work which provided the first comprehensive review of creativity research in many different domains. He was President and a Fellow of Division 10 of The American Psychological Association (Psychology of Aesthetics, Creativity, and the Arts). 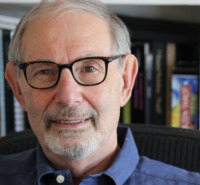 Dr. Pritzker was a founder and Director of the Creativity Studies Certificate and Masters and Doctoral Specializations at Saybrook University where he is a faculty member. Prior to earning his doctorate at USC, he wrote over 75 network television episodes for series including Emmy winners Room 222 and The Mary Tyler Moore Show. He worked as a writer or writer/producer on over 200 network episodes including Breaking Away, Delvecchio, The Partridge Family, The Loveboat, Maude, Fish, Silver Spoons and The Hogan Family.